African Americans constitute more than 35% of all patients in the U.S. receiving dialysis for kidney failure, but only represent 13.2% of the overall U.S. population according to the National Kidney Foundation1. The most common type of diabetes in African Americans is type 2 diabetes. The risk factors for this type of diabetes include: family history, impaired glucose tolerance, diabetes during pregnancy, hyperinsulinemia and insulin resistance, obesity and physical inactivity. African Americans with diabetes are more likely to develop complications of diabetes and to have greater disability from these complications than Caucasians. African Americans are also more likely to develop serious complications such as heart disease and strokes. Preventing chronic kidney disease2(CKD) and its complications is possible by managing risk factors and treating the disease to slow its progression and reduce the risk of complications. To keep healthy kidneys, it is important to control those risk factors for CKD that can be modified. Stage 2: Kidney damage with mild loss of kidney function (estimated GFR 60-89 mL/min per 1.73 m2) and persistent (≥3 months) proteinuria. Dialysis: Treatment to filter wastes and water from the blood. When their kidneys fail, people need dialysis to filter their blood artificially. The two main forms of dialysis are hemodialysis and peritoneal dialysis. End-Stage Renal Disease (ESRD): Total and permanent kidney failure treated with a kidney transplant or dialysis. Glomerular Filtration Rate (GFR): The rate at which the kidneys filter wastes and extra fluid from the blood; measured in milliliters per minute. Proteinuria: Condition in which the urine has more-than-normal amounts of a protein called albumin. If you are at risk, get tested for CKD regularly. Ask your doctor to test your blood or urine. Find it early. Treat it early. If you have diabetes, get tested yearly. Get active. Physical activity helps control blood sugar levels. Getting a checkup? Make sure to get your kidneys checked too. Keep your blood pressure below 140/90, or ask your doctor what the best blood pressure target is for you. Keep your kidneys healthy by controlling your blood sugar and blood pressure. Among people with diabetes and high blood pressure, blood sugar and blood pressure control have been shown to lower the risk of developing kidney disease. Several studies have shown the possibility for preventing or delaying the start of diabetic kidney disease by treating patients who have diabetes with blood pressure-lowering drugs. In addition to lowering blood pressure, these medications reduce protein in the urine, a risk factor for developing kidney disease. Managing blood sugar, blood pressure, and cholesterol levels is very important because these are all risk factors for heart disease and stroke. Because having kidney disease increases the chances of also having heart disease and stroke, early detection and treatment of kidney disease is important for people with diabetes to help prevent or delay cardiovascular death and kidney failure. Learn more about taking care of your kidneys Cdc-pdf[PDF – 281 KB]. Diabetes can cause kidney disease, also known as chronic kidney disease (CKD). The good news is that there is a lot you can do to prevent kidney problems, including keeping your blood sugar and blood pressure under control. What Happens If You Have Kidney Damage? Changes or damage to your kidneys may cause your kidneys to fail. If your kidneys fail, your blood must be filtered (dialysis treatments) several times a week. You may also need to have a kidney transplant. How Will You Know If You Have Kidney Problems? Ask your doctor to test your blood and your pee. If the doctor finds protein (albumin) in your pee, it is a sign of the start of kidney disease caused by diabetes. Your kidneys are not working as they usually do. Get tested for your average level of blood sugar over the past three months (A1C test). Get your A1C test at least twice a year, but ideally up to four times a year. What is the Best Way to Keep Your Kidneys Healthy? Take your medications as directed. Who is More Likely to Develop Kidney Disease? 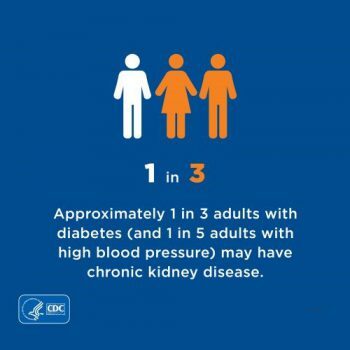 Approximately 1 of 3 adults with diabetes and 1 of 5 adults with high blood pressure may have CKD. In addition to diabetes and high blood pressure, other problems that put you at greater chance of kidney disease include: heart disease, obesity (being overweight), and a family history of CKD. Kidney infections and a physical injury can also cause kidney disease. What Can You Do to Prevent Kidney Failure? Get tested for CKD regularly if you are at risk. Ask your doctor to test your blood or pee. If you have diabetes, get tested yearly. If you have CKD, meet with a dietitian to make a kidney-healthy eating plan. Make the Connection If you have diabetes, ask your doctor about kidney disease. Chronic kidney disease often develops slowly and with few symptoms, many people don’t realize they’re sick until the disease is advanced. Keep your kidneys healthy by controlling your blood sugar and blood pressure. In addition to managing blood pressure and blood sugar levels, managing cholesterol levels is very important because these are all risk factors for heart disease and stroke. Kidney diseases are the 9th leading cause of death in the United States. Approximately 1 of 3 adults with diabetes has chronic kidney disease. Every 24 hours, 143 people with diabetes begin treatment for kidney failure. Check your blood pressure regularly and keep it below 140/90 mm/Hg, but check with your health care provider for your appropriate target. Talk to your doctor about medicines and other ways to lower your blood pressure. Eat foods lower in sodium. Preventing type 2 diabetes is another important step in preventing kidney disease. Studies have shown that overweight people at higher risk for type 2 diabetes can prevent or delay the disease by losing 5 to 7 percent of their body weight, or 10 to 14 pounds for a 200-pound person. You can do that by eating healthier and getting 150 minutes of physical activity each week. The CDC-led National Diabetes Prevention Program can help you adopt the healthy lifestyle habits needed to prevent diabetes. Find a convenient program in your community. Chronic Kidney Disease: Managing 4 Risk Factors 5 out of 5 based on 7 ratings. 7 user reviews.